I am indebted to Victoria Hamilton-Rivers who contributed material for this conversation. Of all the disciplines Werner Erhard engaged with before creating his magnum opus of transformation, it could be said Zen is the essential one. It's entirely appropriate for persons interested in Werner's work to also be interested in Zen. (as Werner may have said). In addition to its koans (of which Hakuin Ekaku's brilliant and perfectly minimalistic "What is the sound of one hand clapping?" is a classic example), the words spoken by a Zen master are typically so drop dead direct that the full impact of what they communicate may be completely missed at first (of which Werner's "What is is, what isn't isn't" is a classic example). The thing is in Zen, "what is" and "what isn't" don't show up on opposite, separate sides of the spectrum. "What is" and "what isn't" arise together. "What is", it could be said, evokes "what isn't", just as "what isn't" evokes "what is". In this way, you could say Zen is binary. Dictionaries aren't written to deliver definitions of words as they're spoken coming from transformation. Yet words are the implements of transformation. So dictionary defintions of words don't always work for me as tools for reliably delivering what I develop in Conversations For Transformation. In such cases, I create my own definitions which I post to The Laurence Platt Dictionary. In the world of data processing and computing, 1 symbolizes "on" and 0 symbolizes "off". "On" and "off" aren't opposites. They're not separate. Yes they can be conceptualized as opposites and separate. But they're not really. They arise together. They're binary. Binary numbering* only uses the two digits 1 and 0. They're not opposites. They're not separate. They arise together. The presence of 1 evokes 0. The presence of 0 evokes 1. The presence of an on evokes an off. The presence of an off evokes an on. The presence of "what is" evokes "what isn't". The presence of "what isn't" evokes "what is". So Zen is binary. It's not so much that Zen showcases the delineation between "what is" and "what isn't" ie between that which is and that which is not. It's that Zen's power comes from experiencing the delineation between "what is" and "what isn't" ie between that which is and that which is not. Driven by this power, who we really are as naked presence bursts forth. I'm hesitant to ascribe a purpose to Zen. But if I did, to create the space from which this naked presence is empowered to burst forth, would be it. If you don't get the humor of Zen (in the anecdotes of Zen, the Zen master is often heard having a good laugh), you don't get Zen at all. From the humorous (Q: How many Zen practitioners does it take to change a light bulb? A: Two. One to change the light bulb, and one not to), to the profound (Q1: How many Zen practitioners does it take not to?) (Q2: What is the sound of one hand clapping? ), to the anecdotal, the quality of Zen is diminished by debate and argument. Yet Zen comes alive as an enabler of the pristine naked presence you and I really are. • I'm clear I have a choice in any situation to give something up, or not. • I can't make anyone take on being cause in the matter. Being cause in the matter is a stand people choose to take on for themselves, or not. • After an "A-Ha!" experience, I'm left with power, with possibility, and with enormous freedom to create any interpretation I like, or not. • Conversations For Transformation enliven the space in which transformation can show up, or not. • Choosing to make the success of humanity my personal business starts with the choice we each have to live who we really are, or not. • There's a whole new sense of calm. I see I'll always be who I say I am - whether things go the way I want them to go, or not. • Peoples' natural response to me authentically being who I really am is love and respect, or not. • I create a space of trust for you. You may chose to step into this space, or not. You have the opportunity to step into it, or not. • I have a choice in the matter of telling the truth, or not. • The end justifies the means, or not (as Werner Erhard may have said). Given everything I've said, I'm mindful of a pernicious trap. It's the pull (if you will) to assign meaning and significance to Zen. So I'll complete this by articulating something explicitly which will bring this conversation closer to what's so, and put it all into the proper perspective. Just as there's the Zen of motorcycle maintenance, just as there's the Zen of gardening, just as there's the Zen of running, calligraphy, and painting, and just as there is (for that matter) the Zen of Buddhism, you could say there's also the Zen of Zen itself. So to say "Zen is binary" and leave it at that, actually isn't good Zen. What's good Zen is "Zen is binary, or not.". 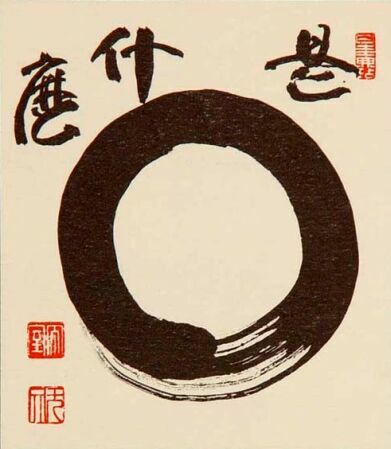 This sumi-e (Japanese word for black ink painting) circle is derived from the Sanskrit word "sunyata". It means "emptiness" or "nothingness" in Zen Buddhism. It was created by Zen master and calligrapher Yamada Mumon Roshi. Most commonly, the way we number is based on 10 - "base 10" aka "decimal". To number using base 10, we use nine digits (one less than the base): 1, 2, 3, 4, 5, 6, 7, 8, 9, and 0. What we call "10" in decimal is really "1" and "0" - one of the base 10, plus 0. So 11 is really one of the base 10, plus 1. But we can number on any base: for example, 8 - "base 8" aka "octal". To number using base 8, we use seven digits (one less than the base): 1, 2, 3, 4, 5, 6, 7, and 0. Notice decimal 8 is "10" in octal: one of the base 8, plus 0. So decimal 9 is "11" in octal: one of the base 8, plus 1. We can also number based on 16 - "base 16" aka "hexadecimal". To number using base 16, we use fifteen digits (one less than the base): 1, 2, 3, 4, 5, 6, 7, 8, 9, A, B, C, D, E, F (we use A through F in lieu of 10 through 15), and 0. Notice decimal 16 is "10" in hexadecimal: one of the base 16, plus 0. So decimal 17 is "11" in hexadecimal: one of the base 16, plus 1. Similarly we can number based on 2 - "base 2" aka "binary". To number using base 2, we use one digit (one less than the base): 1, and 0. The only digits ie the only possibilities in binary are 1 and 0. Notice decimal 2 is "10" in binary: one of the base 2, plus 0. So decimal 3 is "11" in binary: one of the base 2, plus 1. Also notice in binary, any number can be represented as a series of 1s and 0s ie by a series of ons and offs - in other words, by a series of "what is"s and "what isn't"s.